The SPX mirrors our sentiment from London, as we wished we had published last week, although it was perhaps not quite so compelling here. Although, when one gets to see all three US indices together, then the argument becomes more convincing. The pertinent bit is that R1 back on the 20th was at 2845, and that very day, after we had published mind, the intraday high was 2843.54. Today, R1 is at 2855, but as the intraday highs on Thursday and Friday last week were 2860.31 and 2846.16 respectively, so we suspect that change has happened this week. Worth noting that R2 has been at 2865 throughout. No harm in the bulls being aggressive, but ultimately, they will have their limit as to how many futures they can buy that have been forced out due to the dynamic delta. This trip, this looks like R2. So, what else can the ratios tell us? The upside is what you can see, but below the zone there is another story altogether. If there was a strong bullish upswell we would expect the ratios down here to strengthen (come in), so we are nervously watching Y2 weaken (move out) to 2720. R1 has held its own at 2695, but if the bulls were in total control, as we say, that should be rising. 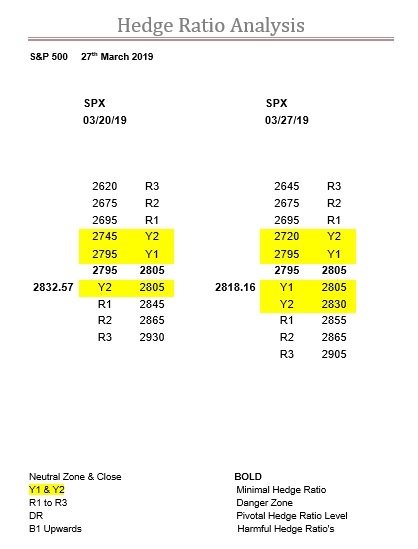 This, also, throws up the intriguing possibility of the zone moving down to 2770-2780, which would be bearish of course. So, to us, it is not all bullish here, and with 150-points of Y ratio still, the risks are plain for everyone to see. But, as always, in the US, it best to check if the DJX has an agenda first, as you can’t escape the correlation naturally.